On Sept. 20 to 22, 2013, Ian Norbury and his lovely wife Betty began their US tour here at the American Woodcarving and Art School. Ten lucky students spent three intense days learning from from a true master carver. Some carved a face and others a torso, but all had a great time. Ian spent time with every student and at the end of three days all were close to being finished. Ian and Betty share all their knowledge and go above and beyond to answer all questions. The good news is they will be back in a “fortnight” (that’s two weeks). Rick Jensen (or as we call him in NJ, (Mr. Mudd) returned for what could be his final trip to NJ. This time most carved mushroom houses, but a few carved tree houses. As usual, Rick told a million stories and occasionally taught class. Actually, Rick gives his all to be sure everyone not only leaves with a treasure but also learns something. All were delighted and amazed at how good their pieces looked. As you can see by the photo there was a lot of laughter. Maybe, Rick will find it in his heart to return to NJ where he is always welcome. Sunday class was a blast! This was a relaxed one day class where fun was the key ingredient. Dennis takes the time to explain and demo each step. It’s impossible to fail. Dennis will be back again SOON! Kirt & Linda treated everyone with another fantastic class. After three full days of hard work and a lot of laughs most students left with a completed carving and a smile on their face. Talk about a fun class—this was it! Rick gave his all and made the students happy & proud. 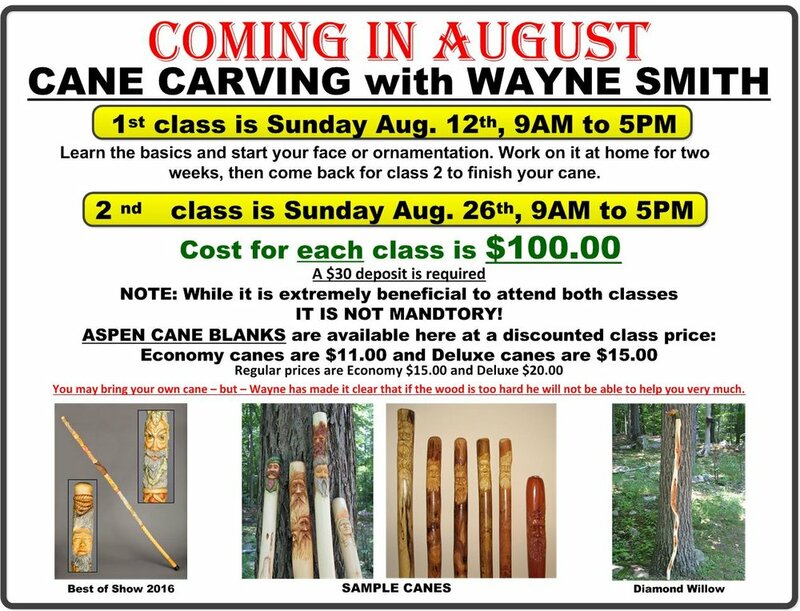 He shares all his knowledge of bark carving and instills the confidence to try something new. All were pleased and asked to have Rick back. And now that Rick found out that there is nice people in NJ—- he will be back next Sept.
Students were treated to a fantastic class by one of the most amiable teachers to teach here. Starting with a talk about the basics of airbrushing and the different equipment available to actual hands-on projects. Each student gained a knowledge of airbrushing as well as a beautiful painting. The ladies painted a rose, while the gents painted a trout or lighthouse. All left with a beaming smile. Hopefully, Joyce & hubby John will be back in 2011 or 12. Fourteen happy students were treated to a great class taught by Kirt & Linda Curtis. Starting from a rough-out they progressed to a carved and burned beautiful “Grizzly Bear”. Kirt will be back April 2011 to carve a Mountain Goat.